Chicago is sizzling with hot new hotel openings. City’s West Loop neighborhood has become the magnet for several new and exciting properties catering to the trendy area’s residents and visitors alike while downtown remains the hotbed for the clientele curious to check out the newly-modernized historic buildings. Here is a sneak peek at what’s on the horizon. Inspired by culinary trendsetter Chef Nobu Matsuhisa, the 155-room Nobu Hotel Chicago is scheduled to open this year in the West Loop. The sleek boutique hotel will feature Nobu’s signature fusion of modern and Asian-inspired design. As with other Nobu hotels, the Chicago property will feature a 10,000-square-foot, ground-floor Nobu restaurant. In addition, Nobu on the Roof will offer an indoor/outdoor lounge overlooking Randolph Street’s popular Restaurant Row. The hotel will also feature 3,245 square feet of multi-use suite space available for corporate events. Nobu Hotel Chicago will also be offering a hi-tech fitness center equipped with Technogym gear, a state-of-the-art spa facility, and an indoor swimming pool. 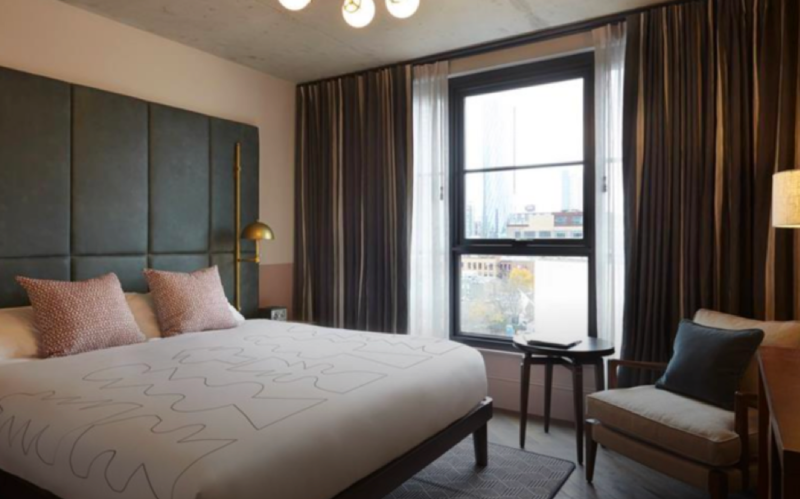 One of the most highly-anticipated hotel openings of the year is The Hoxton, opening in April in Chicago’s hot West Loop neighborhood. Inspired by Fulton Market’s meatpacking past, the design of the 182-room hotel is distinctly industrial-chic. In a nod to the neighborhood’s roots, the hotel rooms feature exposed concrete and warehouse-style floor-to-ceiling windows with city views. The rooms are softened with the addition of pieces by local artists, mid-century-inspired furniture, and custom patterned rugs and wallpaper. Celebrity chef Stephanie Izard has been recruited to head Cabra, a rooftop Peruvian restaurant, in partnership with Boka Restaurant Group. Boka will also operate a basement piano bar and a 200-seat all-day Mediterranean restaurant called Cira (with sister coffee shop Cafe Cira) on the first floor of the hotel. The 12-story hotel also features a seasonal rooftop pool and Hoxton’s first-ever fitness studio. Groups can rent The Apartment, the Hoxton’s meeting and events space made up of five separate rooms that have access to The Pantry, a kitchen stocked with drinks, fresh pastries and snacks. A 39-room boutique hotel is planned for the historic Jewelers Building on Jewelers Row in the heart of the Loop. Located at 15-17 North Wabash Avenue, the 137-year-old building is listed on the National Register of Historic Places and is a city landmark. Completed in 1882, the Jewelers Building is the only example of the early work of famed Chicago architecture firm Adler & Sullivan left in the Loop. The facade will be preserved as much as possible, with soundproof windows installed to muffle the rumblings of the nearby ‘L’ train. Retail and restaurant tenants are also planned. The hotel is expected to open in 2020 and will be managed by a San Francisco-based hotel operator. The Reserve Hotel, part of Marriott’s Autograph Collection, is scheduled to open in late 2020 in the historic 208 S. LaSalle St. building in the Loop. The luxury 234-room hotel-within-a-hotel will occupy the top five floors of the landmark office building designed by renowned Chicago architect Daniel Burnham, located in the heart of Chicago’s Financial District. The Reserve Hotel features a unique story and position in the Chicago hospitality market. It was intended by Burnham to be a “monument to commerce” with a stature equal to public institutions, government oﬃces and libraries. Floors 1-12 of the building are currently home to the JW Marriott Chicago hotel, which opened in 2010. The Reserve Hotel is planned to feature a penthouse and an extravagant ballroom. A $250-million renovation has transformed the former Essex Inn to Hotel Essex Chicago, a new luxury lifestyle hotel in the South Loop. Welcoming its first guests on April 1, Hotel Essex features 274 rooms with sleek mid-century modern style and floor-to-ceiling views. The French-influenced Grant Park Bistro has a light-filled 40-seat dining room that overlooks the open kitchen, along with a seasonal outdoor patio lining South Michigan Avenue. The hotel’s bilevel SX Sky Bar is located on the fifth and sixth floors of the adjacent Essex on the Park residential tower, boasting a sweeping lake view and retractable glass walls that can be opened wide during warm weather. Small plates and craft cocktails are served for lunch, dinner and late night. SX Sky Bar also features a dance floor and intimate spaces for private events. For a peek at all the trendy new hotels in the Windy City, let the professionals at GMS take you for a behind-the-scene site inspection of the new and the established properties in Chicago.